Please Visit the James Bond Film Retrospective for all the Bond Film Reviews. We start with the first James Bond film, though not technically, the first Bond story. Whatever its faults, Dr. No was setting the stage for our iconic agent, introducing certain motifs in the franchise that we still have even to this day. In Jamaica, MI6 agent Strangways (Timothy Boxon, voiced by Robert Rietty) has disappeared. To investigate, the spy agency sends James Bond (Sean Connery). Upon arriving in Jamaica, Bond realizes there is something mysterious going on at Crab Key, an island where no outsiders are allowed. Crab Key was being investigated by Strangways and his Jamaican aide, Quarrel (John Kitzmiller), who was also working with the CIA. The island is the domain of a mysterious Chinese figure named Dr. No. Bond decides the best thing to do is to go to Crab Key, especially after Professor Dent (Anthony Dawson) has attempted to kill Bond under No's orders. Bond and Quarrel arrive under cover of dark, but when Bond awakens, he sees one of the most beautiful sights ever: a girl in a white bikini walking from the sea to the shore. This is Honey Rider (Ursula Andress), a beauty who comes to Crab Key to collect and study seashells. Since she's proven able to elude the guards and never ventures into the island's interior, she's pretty much left alone by them. However, now that the security is aware of Bond and Quarrel's arrival, all three are in danger. Eventually, Bond and Honey are captured, but unlike Quarrel, they are not killed. 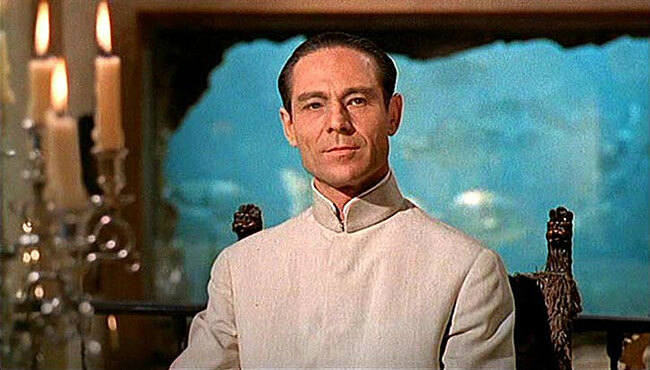 Instead, they are hosted by none other than Dr. No himself (Joseph Wiseman). The bad doctor tells him of his scheme: as an agent for SPECTRE (Special Executive for Counterintelligence, Terror, Revenge, Extortion), he will 'topple' the American space rocket, bringing both the East and West to their knees. Bond manages to escape, kill off Dr. No, rescue Honey, and destroy the doctor's lair, and get the girl in the end. For better or worse Dr. No has many elements that would become hallmarks of the James Bond franchise, but we're getting ahead of ourselves; as a film itself, Dr. No isn't without some major issues. While watching Dr. No, I kept thinking how remarkably slow the film was. I thought that perhaps the Caribbean setting made the film more relaxed than it should have been. It could also be that there were three screenwriters (Richard Maibaum, Johanna Harwood, and Berkeley Mather) adapting Ian Fleming's novel. Somehow the story didn't have a sense of mystery or danger, but of a leisurely stroll until the third act, to where it's almost all action. For long stretches of Dr. No, we get a leisurely-paced film with occasional burst of action. It really isn't until we get to Crab Key that we get a nearly relentless sense of adventure. Part of the problem with this is the build-up to the revealing of Dr. No himself. He really isn't on the screen for more than ten minutes at the most, and it's only until the final part of the film that we get to see him. What we are treated to is his voice, when Dent comes unannounced to his lair to inform him of Bond's investigation. Somehow, while it was good to have a remarkably calm voice telling his underling of his plans for this meddlesome agent, it also didn't bring a great deal of menace. Tied into that is when there is an attempt on Bond's life via a tarantula. Somehow, that method of murder didn't strike me as particularly threatening or dangerous, only slightly elaborate and even comical. At this point, Monty Norman's score only made that particular scene more amusing in its seriousness. I personally think a bomb would have worked better. Just my view. I think part of the reason Dr. No didn't go over well with me is because there really wasn't any sense of suspense or mystery. I knew Miss Taro (Zena Marshall) worked for Dr. No, so the entire attempt to kill him through her either by trying to drive him off the road to her home or bringing someone to kill him post-coitus, didn't work for me. I, and Bond himself, knew the driver who picked him up at the Kingston airport wasn't from Government House, so again, it's a waiting game to see when he will strike. When the hostesses at Crab Key, Sister Rose and Sister Lilly (Michele Mok and Yvonne Shima respectively) greet Bond and Honey so pleasantly, there is a touch of lightness that is welcome. However, it does beg the question, 'if Crab Key is forbidden to all visitors, why exactly does Dr. No have rather lush accommodations for guests?' Incidentally, one wonders why Dr. No doesn't just kill Bond or let them die from the radioactivity they picked up along a stretch of forbidden swamp on Crab Key? I know it's because No is impressed with Bond's skill, so much so that the bad doctor thinks 007 could be recruited for SPECTRE, but I would have liked to have seen that stretched out a bit more. However, as bad the ultimate reveal of Dr. No himself may have been featuring the least Asian-looking man since Mickey Rooney played a Japanese photographer in Breakfast at Tiffany's despite the doctor's Eurasian background, the reveal of 007 is one of the best and most iconic in film history. The swagger in Connery's voice and delivery, coupled with the-now iconic James Bond Theme playing behind him, makes that a great moment in Dr. No. We see in Connery's performance that James Bond is someone who flirts with danger: figuratively and literally. He also has a great sense of humor. When they first meet, Honey tensely tells Bond she's looking for shells and demands to know what he's doing. He quips, "I'm just looking". As great as Bond's introduction is, nothing beats the breathtaking moment when Honey Ryder appears before us. The imagery is deliberate: she rises from the ocean like Aphrodite, but it still works because it appears so natural and because Andress simply is amazingly beautiful. I can't say she was a great actress in Dr. No, but as the naive island girl whose father she suspects was also killed by Dr. No, Andress did a respectable job. In a too-brief appearance, a pre-Hawaii 5-0 Jack Lord comes aboard as CIA agent Felix Leiter, and while not the greatest performance you do see hints of what could have been a real star-making turn. In his also too-brief time as the villainous Doctor No, Wiseman was perfect as the calm, almost urbane villain. My only caveat with Wiseman apart from his unconvincing make-up job, was that he didn't prove to be a good antagonist. Dr. No was just the device to get the story going, not the central figure in all the intrigue and murderous mayhem going on in his name. Again, at the risk of getting ahead of myself, when it comes to other Bond villains, the bad doctor didn't have a major role in the film itself. Moreover, his demise was both quick and somewhat anticlimactic, with none of the big buildup that others were to have. Finally, while Peter Hunt's editing was well-done in particular when Bond, Quarrel, and Honey were escaping No's guards by the river, the sets and costumes make Dr. No a bit dated. Dr. No got the ball rolling on the James Bond franchise, and it's a good though not great start to an extraordinary franchise that would hit greater heights and sink to lower depths. Its leisurely pace, and the way it generally just feels 'off' in relation to other Bond films, is precisely what I like about Dr. No, but you can't argue about taste. I would never disagree with your opinion on Honey Ryder rising from the sea, though. What an iconic scene. Works just as well half a century on. Indeed: an iconic moment in an iconic franchise.